WonderCon 2016's Autograph Area features fan-favorite stars and celebrities. 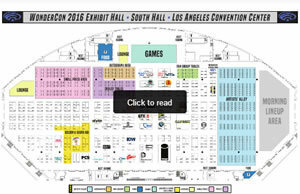 You'll find the location of the Autograph Area in our Exhibit Hall map which we've linked for you to the right. BBC AMERICA is excited to announce a special autograph signing with the men of Orphan Black -Jordan Gavaris, Kristian Bruun and Kevin Hanchard ahead of the highly-anticipated new season. Please visit West Hall A on Saturday morning for details. Signing will be at a later time on Saturday evening. You must participate in the ticket drawing for a chance to win. Marvel and ABC are proud to announce an exclusive autograph signing with the cast and producers of Marvel’s Agents of S.H.I.E.L.D. Please visit West Hall A on Saturday morning for details. Signing will be at a later time on Saturday. You must participate in the ticket drawing for a chance to win. Twentieth Century Fox Television is thrilled to announce a special autograph signings! Please visit West Hall A on the morning indicated for details. Signing will be at a later time that day. You must participate in the ticket drawing for a chance to win. Meet the cast and creator of FOX’s Emmy Award-winning animated series BOB’S BURGERS at a special autograph signing featuring creator Loren Bouchard and the hilarious cast including Kristen Schaal, John Roberts, Dan Mintz and Larry Murphy. Signing by the star-studded cast of WAYWARD PINES, including Jason Patric and Djimon Hounsou, and Donald De Line (executive producer), Ashwin Rajan (executive producer) and Blake Crouch (executive producer/ author). Warner Bros. Home Entertainment is thrilled to announce the following special autograph signings! You must participate in the ticket drawing for a chance to win. Jason O'Mara (Batman), Jerry O'Connell (Superman), Christopher Gorham (Flash), Stuart Allan (Robin), Jake T. Austin (Blue Beetle), Brandon Soo Hoo (Beast Boy), Kari Wahlgren (Starfire), James Tucker (Producer), Sam Liu (director), Phil Bourassa (character designer), Bryan Q. Miller (screenwriter) and a few possible other guests will be signing a WonderCon exclusive collectible poster for their upcoming release JUSTICE LEAGUE VS. TEEN TITANS. Signing of a WonderCon exclusive collectible poster by cast members and filmmakers for the upcoming release of LEGO® SCOOBY-DOO! : HAUNTED HOLLYWOOD. Please visit West Hall A on the morning indiciated below for details. You must participate in the ticket drawing for a chance to win. Stars Chris Wood, Christina Moses, Claudia Black, Kristen Gutoskie, Hanna Mangan Lawrence, George Young, Trevor St. John, along with executive producers Julie Plec, Matt Corman and Chris Ord. Stars Rose McIver, Malcolm Goodwin, Rahul Kohli, Robert Buckley, David Anders, along with executive producers Rob Thomas and Diane Ruggiero-Wright. Producers Michael Jelenic and Aaron Horvath, along with voice actors Greg Cipes, Khary Payton, Scott Menville, Tara Strong and Hynden Walch. Stars Eliza Taylor, Bob Morley, Devon Bostick, Lindsey Morgan, Christopher Larkin, Richard Harmon, Isaiah Washington and executive producer Jason Rothenberg. Stars Brandon Routh, Caity Lotz, Ciara Renée, Franz Drameh, and executive producers Marc Guggenheim and Phil Klemmer. Actor, Mike, the Green Ranger (Power Rangers: Super Samurai), East Los High! Enjoy props and set pieces from the sci-fi adventure series with an all-star cast dubbed "Firefly meets The Office with a Star Trek twist!"